Fashion Pony, originally uploaded by www.DaveWard.net. Dude tried to centre the buckle over his fly, which is wrong to begin with. And then he missed. I will laugh at you if you do this, because it makes you look like an asshat. It puts your entire outfit off-kilter, even if someone doesn’t necessarily notice exactly why. Especially if you don’t match your belt and shoes. In searching for photos to explain this complaint, every single person that I found doing things the stupid way was male. Why is that, I wonder. Pay attention, ya doofs! Sometimes I wonder if I pay too much attention to relatively-pointless details. But then I figure, I don’t really have anything major to complain about, so I’d probably be pretty out of luck for a hobby. Plus, menfolk. The womens, they will notice these things. You will lose points. Now… out into the city, to inaudibly click my tongue and invisibly shake my head at people on the train. Brown Belt & Blue Jeans, originally uploaded by RicoFit. 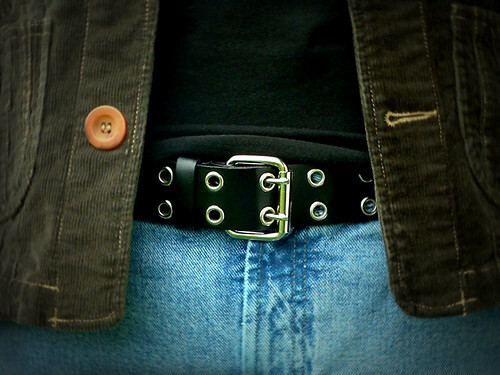 (The sort with a conventional buckle, anyway). The buckle should not be in the centre. It belt should be placed (more or less) so that the midpoint between the loop and the exposed half of the buckle lines up with the button on your fly. The photo above shows correct placement.